Home Numerology Angel Number Meanings Quadruple Digit Angel Numbers Meanings Angel Number 5555 Meanings – Why Are You Seeing 5555? Sometimes the same number seems like it is everywhere. Reading the newspaper on a Sunday morning a story catches your eye, and you notice that the hotline for more numbers ends in 5555. You head off to the farmers market and spend more than you expected at the fresh fruit stall. Your total comes to $55.55. Later in the day you pop into the book store and a new title catches your eye. You notice that the barcode on the back of the book ends in 5555. Why are you seeing 5s everywhere you go? Could the Angels be trying to tell you something with these numbers? What could the quadruple digit Angel Number 5555 be trying to tell you? What does Angel Number 5555 mean for love? Angel Number 5555 is a quadrupling of the vibration of the number 5, so when 5555 shows up, you can be certain than it relates to your personal freedom in some way. The number 5 is linked with our independence, sense of personal freedom and spirit of adventure. It can represent opportunities for freedom and adventure, or it can suggest that we need to break a bond that is preventing us from growing. It is also linked with the feelings of isolation and rootlessness that can sometimes accompany intense independence. Angel Number 5555 also culminates in the number 2, as 5+5+5+5=20, which is further reduces to 2+0=2. This links 5555 more closely with the bonds that hold us than the number 5 alone. 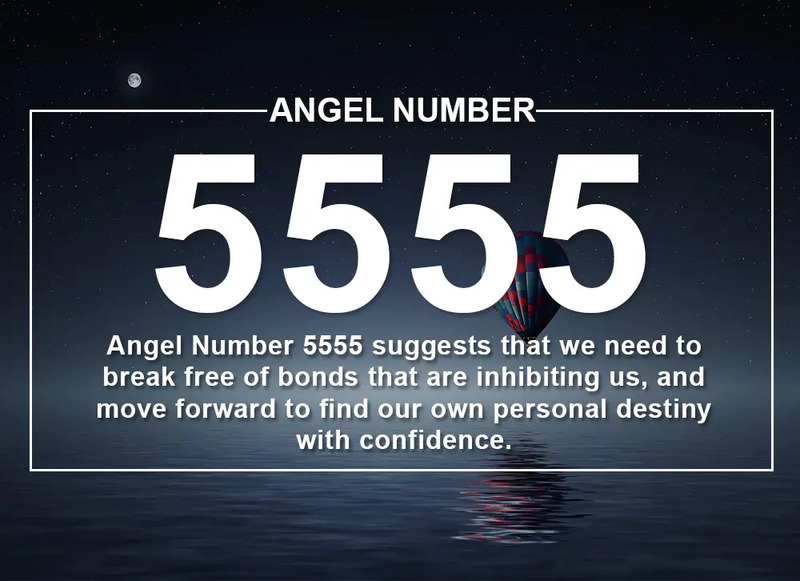 Angel Number 5555 suggests that we need to break free of bonds that are inhibiting us, and move forward to find our own personal destiny with confidence. Sometimes when we are feeling stagnant, or perhaps after a difficult time, a bad break up, or losing a job, we feel like we need something to re-energize us. Often we have had some kind of adventure in the back of our minds for many years, or an unexpected adventure has landed on our doorstep. Angel Number 5555 suggests that now is not the time to play it safe, and that this adventure is exactly what we need to lift us up and put us back on the right path. Go for it. It is always useful to have the feedback of others around us, as they can help us see ourselves more clearly when our vision is clouded for some reason. They can help us realise when we are being unreasonable, or maybe being lazy. But there is a difference between feedback, and doubt. Some people will always doubt the ability of others because they are constrained by their own fears. If you have your heart set on something, Angel Number 5555 can show up to suggest that in this case, don’t listen to those who don’t think you can. Only you know what you are capable of. Maybe you have been coasting through life for a while. You are letting your partner take the lead on the home front in terms of buying a house, planning your savings, and allocating household responsibilities. You are accepting new roles and responsibilities from your boss without really considering whether they take your career in the direction that you would like. Angel Number 5555 can show up to tell you that it is time to stop coasting and start making some active decisions about your future. If you do not, you may soon find yourself in a place you never expected, and never wanted to be. The modern world grants us many freedoms, we can travel the world, live as nomads, and sometimes pass weeks without seeing our friends and just liking their posts on social media. While this grants us great freedom, it can also leave us feeling isolated. Angel Number 5555 can appear when our independence is starting to weaken us and leave us feeling isolated, rather than boosting us and giving us confidence. It suggests that we take the time to reconnect with our roots to reinvigorate ourselves. This does not mean taking a step backwards, but it does mean remembering where we came from and the people who supported us along the way. 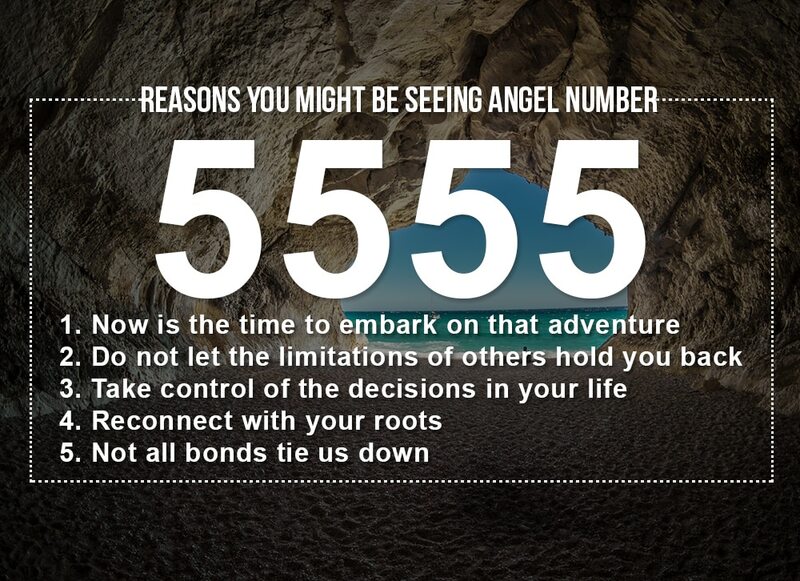 Angel Number 5555 often relates to bonds that hold us in place and keep us from reaching our full potential. But not all bonds keep us bound in place, some drag us forward and help us accomplish more than we imagined faster than we could have hoped. Sometimes Angel Number 5555 shows up to suggest that a bond that we are wary of is the type of bond that will pull us forward rather than hold us back. Do not fear all responsibility, it can be liberating. When it comes to love, Angel Number 5555 often suggests that our relationship, or our intense desire to be in a relationship, is stifling us. Perhaps we are making too many compromises to support our partner, or we are expending too much energy trying to find someone to complete us. While Angel Number 5555 does not suggest that we need to walk away from a relationship, it does suggest that we need to find our independence. It is time to branch out on our own and start exploring our own interests and desires independently. We may find our relationship is actually stronger as a result, and that the new opportunities we encounter throw us into the path of the person we have been looking for. Seeing an Angel Number is always a blessing as it means not only that the Angels are with you and supporting you, but that you are in a positive place where you are ready to see and receive their guidance. Nevertheless, understanding what the complex meaning behind a number signifies for you can be challenging. Always pay attention to what you were doing or thinking when the number was shown to you. Angel Numbers will always appear when the thing to which they relate is in front of you in some way. Then use your intuition to understand how the message applies to your life. Do you seek guidance and insights into the past, present and future, with regards to relationships, love, or money? If you are frequently seeing the 5555 Angel Number, take this popular free test to see whether your Guardian Angel is trying to send you an urgent message. Keep seeing 5555? Could the Angels be trying to tell you something with Angel Number 5555? Learn its important meanings, including finding our own destiny!